Honor Jane Newman is a psychologist currently living in Melbourne who has penned a short and easy-to-understand self-help book for women living with perfectionism, anxiety and chronic fatigue syndrome (CFS). Killing the Perfectionist Within is a simple little book that gives the reader an insight into the various symptoms of these conditions and then delves into exercises that can be undertaken to start on the path towards healing. Newman approaches her self-help book with a positive and honest attitude and this shines through on each page. From the get-go, we are able to view perfectionism, anxiety and CFS from an insider’s point of view. Newman has not only counseled many women going through these issues but has also personally experienced them herself. The first half of Killing the Perfectionist Within is part scientific fact and part lived experience. This first section explains why people develop these three issues in their life, ranging from explaining that parenting styles can play a huge role in the development of perfectionist tendencies to providing insight into when symptoms are becoming serious and professional help needs to be sought. Newman also makes a bold statement in this part of the book by claiming that perfectionism often leads to CFS; although she doesn’t verify this claim with empirical evidence, Newman writes that has seen a growing link throughout her career between these two disorders. It would be great to see Newman expand on this claim, and so I hope that she continues with this in another book. The second half of Newman’s self-help book is part exercise logbook and part helpful strategies that one can take on in their journey of killing the perfectionist that lives within them. It includes breathing exercises, body image tips, a guide on how to self-manage, sticking to femininity while letting go of perfectionism and to managing and dealing with guilt. While the book is aimed at helping those who have suffered or are currently suffering through the particular issues of perfectionism, anxiety, and CFS, the book is flexible enough to also be helpful for those who don’t identify with these problems. The reason for this is not only that Newman aims her writing towards a wider audience, but also because we can all relate, in some way or another, to some of the issues and symptoms faced by those with these particular disorders. So, while you may not have been diagnosed with anxiety, you may find Newman’s breathing exercises relevant to helping you calm down on your way to work, or if you don’t think you are a perfectionist you may realise through reading this book that you sometimes have perfectionist tendencies and so can make use of the strategies that Newman presents. Killing the Perfectionist Within is an important read for girls and women, for anyone who needs coping strategies for their anxious tendencies, or for counselors and psychologists who need a book to refer to that specialises in these particular issues. If you’re feeling the pressure of society on your heels and feel like you need to live up to impossible expectations, take a few hours out of your time to sit down with this book and to soak in Newman’s words—trust me, it will be worth it. 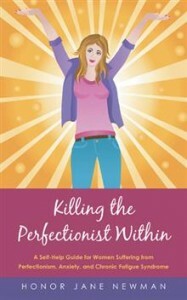 Once the perfectionist within is gone, your true self will be able to shine through. This sounds like an interesting read. Ah, if only it had been available 10 years ago when I was in my 20′s! Books like this are important. I can totally see how long term stress/anxiety can impair one’s immune system and general health, both mental and physical. The source of this perfectionist tendency definitely comes from external sources. Finding your true self is a hard and long road. Really want to read it now! This entry was posted in Books, Health and tagged books, feminism, health, mental health, Review. Bookmark the permalink.